DO KIDS STILL appreciate riddles? When I was a kid, I loved them. Some riddles were stupid. Others silly. Many challenged me. Whichever, riddles usually made me laugh. So when I saw one of my favorite childhood riddles posted in a newspaper stand outside the Faribault post office, I laughed, exited the van and walked across icy surfaces to photograph the posting. Q: What’s black, white and read all over? I heard that riddle countless times when growing up. I liked it then, like it still, although the riddle no longer rings reality. Newspaper aren’t read all over. And that saddens me, a former journalist. Too many people no longer value newspapers. Rather, they get their news from other sources, not necessarily the most reliable sources either. Newspapers and journalists are too often the targets of criticism, much of it unjustified. I’m not talking about the publications that call themselves newspapers, but truly are not in any sense of the word. I’m talking about legitimate “news papers” staffed by hardworking, unbiased journalists. I value newspapers, especially community newspapers. I value the stories reporters write, yes, even the hard news. I value that newspapers keep me informed, expose me to differing viewpoints on the editorial page, alert me to happenings and issues in my community and elsewhere. I recognize that my feelings about newspapers and journalists stand much stronger than those of most people. In my days working as a news reporter, I was attacked by individuals who disliked me quoting them or writing on an issue they’d rather not see in print. But their disdain didn’t stop me from doing my job. We need a free press, a strong press, a press that does not cave to political or societal pressure. Our democracy depends on freedom of the press. Q: What happens in a country without a free press? TELL ME: Share your thoughts or share a riddle. Please be respectful in your comments. A: How do you make a Kleenex dance? Q: Put a little boogie in it. MY MIND WAS ALREADY reaching for the phone, punching the number for the circulation department of the Faribault Daily News when I paused. With a sports headline printed above the nameplate and an ad stretched across the bottom of an otherwise blank front page, I realized—kaboom—that the white space couldn’t be accidental. There was a reason the paper I grabbed from my front steps on Tuesday morning was devoid of front page news. I flipped to page two. There I found my answer. The absence of news was intentional. According to an article published there, more than 200 Minnesota newspapers are participating in a “Whiteout” to remind readers of the importance of newspapers in their local communities during Minnesota Newspaper Week. Brilliant, simply brilliant. What an incredible visual way to make a point. As a former newspaper reporter, I especially value freedom of the press. I hope the average person realizes just how important a free press is to our democracy. When a government controls the media, we lose our freedom. I can’t recall a time in the U.S. when the media have been more ruthlessly attacked by people in power than now. When I think back to my years as a community journalist, though, I recall efforts by some locals to curtail my reporting in several small Minnesota towns. A high school music teacher once attempted to intimidate me after I wrote about controversial discussions at a public school board meeting. Likewise, a realtor verbally attacked me when I wrote about city council proceedings that involved him. A school superintendent in one community treated me with disdain after I covered a student walk-out. Thankfully my editors backed me up and I continued to do my job. Being a journalist isn’t easy, especially in today’s world. I expect the pay, the long and odd hours and stress are just as awful as when I worked in the profession decades ago. And the criticism is fierce. People complain all the time about the media. Sometimes those complaints are justified. But mostly not. I say, “Stop blaming the messenger.” Journalists do not make the news. They are only reporting it. And we should all value that they have the freedom to do so. SHOULD A NEWSPAPER charge for publishing a letter to the editor? My Minnesota State University, Mankato, journalism professor Robert Shipman would likely turn over in his grave if he read that question. He impressed upon me that the editorial page is the heart of a newspaper. A staunch supporter of community journalism, he would not advocate paying for letters to the editor. Neither do I.
I have great respect for this newspaper man who nearly 40 years ago taught me the basics of journalism—instilling in me a strong sense of fairness in writing balanced news stories. Opinion, he emphasized, should be reserved for the editorial page. This brings me back to charging a fee for letters to the editor. Interestingly enough, my concern is prompted by a notice published in The Gaylord Hub, a third-generation family newspaper where I accepted a reporting job right out of college. Decades after I left my two-year stint at this small southern Minnesota weekly, I still get The Gaylord Hub. Unlike most community newspapers, The Hub does not have a strong editorial page. Rare are the editorials. However, locals often voice their opinions in letters to the editor. There’s been significant controversy in Gaylord related to school issues. But now the publisher/editor has established a new policy for election-themed letters. Policies for letters to the editor are the norm at newspapers. Many publications restrict length; monitor for libelous and offensive content and personal attacks, etc. ; and don’t publish election-related letters in the final issue before an election. But, in a quick perusal of the internet, checking out several major dailies across the country and several Minnesota daily and weeklies, I found none with a “pay for” publication fee. The Little Falls based The Morrison County Record, for example, states that “Letter writers are encouraged to stick to the issues and the positions on issues and qualifications of the candidates.” Letters that lean toward advertising aren’t published. In Gaylord, though, under the new policy, if you want to write a letter supporting or opposing a candidate or a political party, you’ll have to pay for it. Thirty dollars for up to 300 words for a Paid Election Letter. I get where the newspaper is coming from with this policy. Some people will abuse the system by viewing the editorial page as a free advertising opportunity. But to blanket apply that to all election-focused letters seems a suppression of opinions. The policies established by The Morrison County Record seem more appropriate, more balanced in curbing potential abuse while maintaining freedom of expression. That said, there was a time when newspapers printed obituaries and engagement, wedding and birth announcements at no cost to readers. No more, at least in most publications. Would my college professor opine that change. He likely would. Robert Shipman was Old School community journalism. He was all about integrity, unbiased reporting, getting facts right and, above all, always always spelling names correctly. He taught me well. He taught me that the opinion page is the heart of a newspaper. The new letters to the editor policy published in the August 4 edition of The Gaylord Hub. SMALL TOWN NEWSPAPERS make for some interesting reading. Stories can get downright personal and to the point. For example, I found a gem last week online at The Redwood Falls Gazette, a twice-a-week newspaper published in Redwood County in southwestern Minnesota. It’s the newspaper I grew up reading. 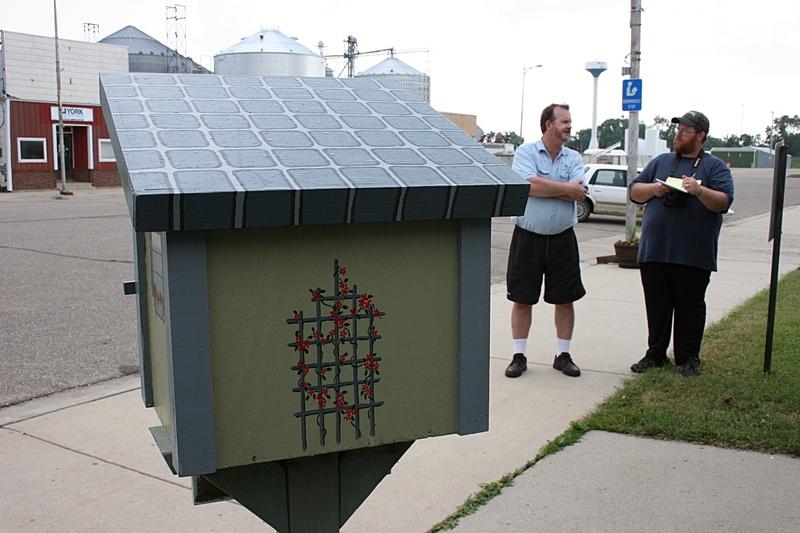 The Redwood Falls Gazette editor Troy Krause, right, interviews Todd Bol, co-founder of the Little Free Library in Vesta in early July. Bol gave a LFL to my hometown and installed it at the Vesta Cafe. In the listings of the Redwood County 4-H county fair champions, Troy Krause of the Loyal Scotties was overall grand champion in flower gardens, while Kelly Zwaschka of the Vesta Vikings won champion child development. How’s that for a birth announcement? Obviously Kelly’s interest in child development, even as a 4-Her, was a clear indicator of her future. As for Todd, I believe flower gardening could be connected to creativity/writing. The third piece of interest was published in last week’s The Gaylord Hub, where I worked for two years as a news reporter and photographer right out of college. Avery Grochow, past president of The Gaylord Chamber of Commerce, penned a letter to the editor which I am certain is the current coffee shop talk of Gaylord. We, as the chamber board, are constantly trying to do our best for our community and are constantly being criticized by some for our decisions. Apparently locals were grumbling about the food—who supplied it and how it tasted—at the community’s annual Eggstravaganza summer festival. New volunteers, replaced Dewey (whoever that is; my words here, not Avery’s), who “wanted a year off from all the arguments.” They stepped up and worked through a new bidding process for the supplies, awarding the bid to the lowest bidder. We have had comments both ways about the supplying of hamburger. Some have criticized us in the past because the hamburger was too spicy, that they would rather have plain burgers, and we are now being criticized that we are having plain burgers and not spiced burgers. No matter what we do as volunteers and directors for the Chamber, we can’t please everyone…We did what we thought was fair to everyone by taking bids on everything and stand by our decision. Now, just imagine how difficult it must have been for Grochow to write this letter. Not an easy thing to do when you live in a small town like Gaylord where everyone’s lives are intertwined. I give Grochow credit for having the guts to publicly voice his opinion in print. He doesn’t just vent, though. He offers a solution. And therein lies the point best taken by those who read his letter. …if anyone has better ideas for us, we still are short of directors and could use all the help we can get to make our Chamber even more successful. We also have openings on the board so you can be part of the decision making, instead of just always making bad comments because you don’t like what we did. Remember, we, as the Chamber Board of Directors, are just volunteers trying to make Gaylord a better place to live and hopefully to have a great celebration. Those closing remarks are words we could all heed because I expect you, like me, are guilty of occasional grumbling and complaining.